You get an idea gnawing in the back of your cerebral cortex and that gnawing slowly but surely becomes a fully manifested psychotic episode. I've got this dwarf sitting inside my brain you see, smoking a fine stogie, drinking whiskey and looking at a Penthouse Magazine while keeping one eye on the controls. He's very apt at keeping me on the lookout for redheads in thongs, Kate Beckinsale sightings (thank the heavens for her), and the occasional fine cigar (on the off-chance you enjoy a fine smoke - look no further than the Acid Line by Drew Estates). You see, for years I've oft-looked at the Manual of the Planes with some amount of awe and as much exasperation because let's face it, no single volume dealing with as massive a subject as the various planes of existence can possibly cover everything. The book had some neat ideas, but invariably it, and others that followed for the newer editions of AD&D always falls short in trying to explain what exactly the planes each look like. They instead choose a couple popular planes, then go into detail talking about who lives there, their ecology, their enemies, and even what their cities/fortress's of solitude look like. In this and only this regard, I believe the Manual of the Planes is a rousing success. I understand that it is impossible to describe the Plane of Dust, Shadow, Fire etc. fully, or even vaguely, but its even more difficult to map it - both as a DM and as the unfortunate player in the game. With all that said, over the last few years I've seen a craze take over the RPG tabletop realm, all based on the simple concept of the Old-School Dungeon Geomorphs produced by the fine folks at TSR. You all know what I'm talking about, and Dyson Logos is to be credited for making these goodies more popular than they have ever been by creating a fantastic take on them. His blog: A Character for Every Game covers his designs in full detail. Other artists have taken Dyson's idea and ran with it and in doing so many are now part of Online Generators that will randomly produce a map based on all the various tile sets. Heck, we even have a set of Dice, Cards and Font designed around the concept of Dungeon Geomorphs - you can view the goodness here. I was sitting staring at the Manual of The Planes, when it suddenly hit me (well actually I admit it was the dwarf throwing his empty whiskey bottle against the back of my left eye) why not create a set of Dungeon Geomorphs based on the various Planes? So I rolled on a random table to determine which plane I would try and create as a set. It's only a base set of 9 tiles and right now consider this a demo because lets face it I'd go blind and crazy doing a hundred of these before seeing if anyone even likes them. Overall, I'm extremely pleased with how they initially turned out. I realize as well they may be a bit bland, but I think that is the point. A DM can take these, throw them together randomly, and produce a section of the Elemental Plane of Fire that can be used for a special encounter that his players can explore, while also dropping in various points of interest - be they encounters, structures etc. 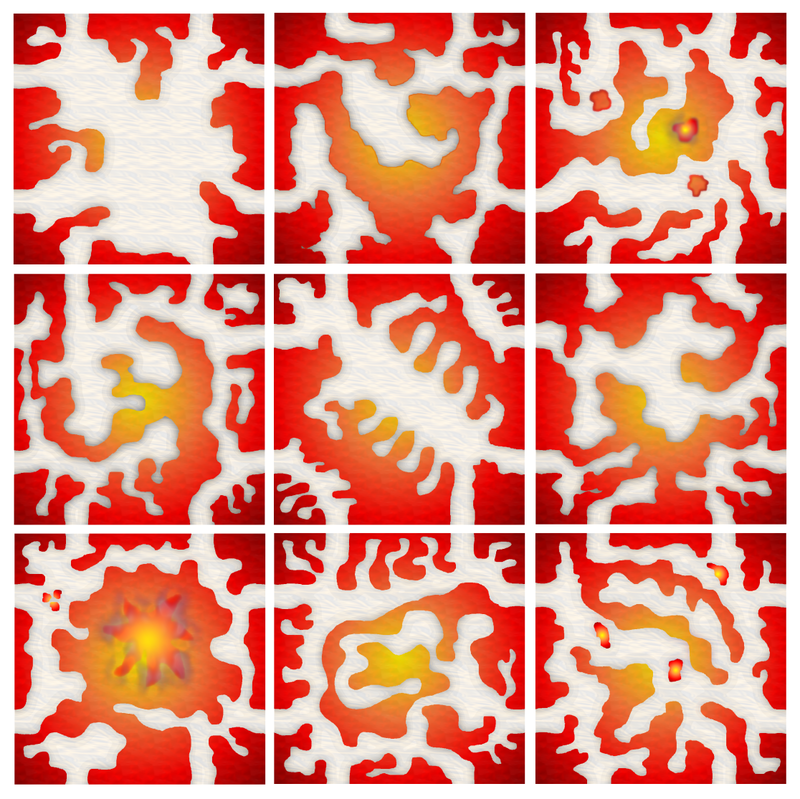 Each tile is 10 squares on a side (10X10), and each has two exits per side. I'm planning to do other planes as well. Earth, Air and Water seem like a good place to focus, but I do have some ideas for those "other" planes. Is this the next logical step in the evolution of the simple Dungeon Geomorph?, I'm really not sure, but do me one favor whatever you decide. Don't let the dwarf hear about it, cause I'll never live it down. "Butter helps every burn mm-hmm"